11/24/2008Share this story on Facebook! 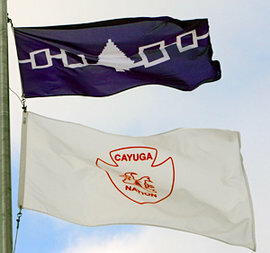 The Haudenosaunee and Cayuga Nation flags fly outside the Campus Center in November. Robert Spiegelman's website combines fresh research, dramatic visuals, and unique, animated maps to explore the Sullivan-Clinton Campaign's dark origins, key players, main events, tragic and victorious aftermaths, and lasting results. November means snow and Thanksgiving to many IC students, but for the anthropology department, it's Native American Celebration Month at Ithaca College. For years the department has used the month as an opportunity to embrace and celebrate the rich culture of the Haudenosaunee, also known as the Iroquois Confederacy. The Haudenosaunee are comprised of the six nations -- Seneca, Cayuga, Oneida, Mohawk, Tuscarora, and Onondaga -- all of whom resided in upstate New York. The Cayuga nation lived right here in Ithaca, New York, but was forced out in 1779 by General John Sullivan at the orders of George Washington. Anthropology professors Brooke Hansen and Jack Rossen organize events to educate others about the Haudenosaunee and this dark chapter in Ithaca’s history. Through the Native American Studies program, Hansen and Rossen took a group of students to the Cayuga’s 70-acre ancestral homeland near Cayuga Lake, a farmland that both professors helped the Cayugas regain in December 2005 through their organization called SHARE. Dr. Robin Kimmerer, Director of the Center for Native Peoples and the Environment, spoke to IC students as part of Native American Celebration Month. This month also featured two presentations. 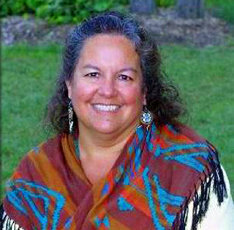 First, Dr. Robin Kimmerer (Potawatomi), Director of the Center for Native Peoples and the Environment, helped IC students understand environmental sustainability through the traditional ecological knowledge of Native Americans. Later in the month, sociologist, multimedia artist, and writer Robert Spiegelman presented new research on the Sullivan-Clinton Campaign and its impact on native culture, the land, and today's environment. Throughout November, the Haudenosaunee’s flag will fly outside IC's Campus Center.